Time for another great giveaway! This one is for those of you with elementary students. 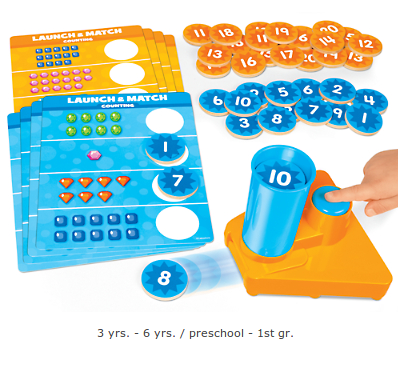 Our friends at Lakeshore have made counting more fun than ever with their lively Launch & Match Counting Game. It is perfect for children in preschool through 2nd grade. If you're looking for a game that strengthens number recognition and counting skills, this would be a wonderful addition to your collection. To play, kids launch wooden tiles from the dispenser and place them on the blank spaces on their game mats…matching numbers to quantities as they go! The game includes a tile dispenser, 8 double-sided game mats and 40 wooden game tiles. Up to 4 kids can play. One lucky MommyMaestra reader will win a Launch & Match Counting Game!